Paul J. Guerrino DDS PC owns and operates Guerrino Dentistry & Associates, a dental practice with several locations throughout Westchester County. As evident by his Pinterest page, Paul J. Guerrino DDS PC is passionate about dental health. His clinics in Mount Vernon, Armonk, Hartsdale, and Scarsdale employ a wide range of skilled dental specialists who are dedicated to providing exceptional dental care. To continually improve patient satisfaction rates, Paul J. Guerrino DDS PC and his staff stay up to date on the newest technological advancements, such as the new product The Wand® STA®All-Injection System. Often, the biggest source of stress in a dental office stems from the anxiety of a syringe. Fortunately, The Wand STA All-Injection System enables pediatric dentists to administer injections in a pain free way. The device is equipped with disposable handpieces in four different needle types, as well as single tooth anesthesia, optimal for delivering anesthetic to the PDL space of a single tooth. This means no more unnecessary numbness of the lips, cheeks, and tongue after a procedure. This new device delivers a computer-regulated flow of anesthesia that is painless, consistent, and accurate. The pain management is so profound, many patients don’t even realize they have received anesthesia. This minimizes disruptive behavior in children caused by stress and fear, resulting in an exceptional dental experience for all. Furthermore, dentists no longer stress about patients biting their lip or tongue due to collateral numbness. Dr. Gordon Chiu, a general dentist from Homestead. Fla, claims the product not only puts patients at ease, but also allows dentists to boost production. There is no waiting time, which means bi-lateral dentistry can be performed in a single appointment. This can increase referrals, increasing the success of the practice. As he is passionate about the dental hygiene of all his patients, he encourages individuals to bring their children for their first dental checkup at one to two years old. Common practice is to visit the dentist about six months after the eruption of the child’s first tooth, as emerging baby teeth need just as much care as fully developed teeth. During the first checkup, the dentist or family health nurse will check for several things, including how well the teeth are being cleaned, any spotting or color changes that could result in decay, and the number of baby teeth as well as their spacing and placement.As he is passionate about the dental hygiene of all his patients, he encourages individuals to bring their children for their first dental checkup at one to two years old. is to visit the dentist about six months after the eruption of the child’s first tooth, as emerging baby teeth need just as much care as fully developed teeth. During the first checkup, the dentist or family health nurse will check for several things, including how well the teeth are being cleaned, any spotting or color changes that could result in decay, and the number of baby teeth as well as their spacing and placement. Paul J. Guerrino DDS PC is a dental-implantologist with more than 20 years of experience. He is the owner of Guerrino Dentistry & Associates; a practice with several locations throughout Westchester County, New York. Typically, children develop feelings of anxiety or fear when it comes to visiting the dentist. Paul J. Guerrino DDS PC suggests bringing children along to the dentist at a young age so they can become accustomed to the environment. Choosing a dentist with a good kids corner can also help them feel at ease. Paul J. Guerrino DDS PC recommends several tips when it comes to caring for kids’ teeth. In addition to regular trips to the dentist, it is important in order to help children brush their teeth at least twice a day, use a junior strength toothpaste, dilute fruit juices, and don’t allow nighttime snacks after brushing. You can learn more about Paul J. Guerrino DDS PC’s dental tips and blog posts by following his pins on Pinterest. Guerrino Dentistry & Associates is passionate about providing the best possible care to patients of all ages. Call to set up an appointment for your child today! Before obtaining dental implants, which are shown above, Paul J. Guerrino DDS PC advises patients to spend time planning for this service. Hello and welcome back to my blog! 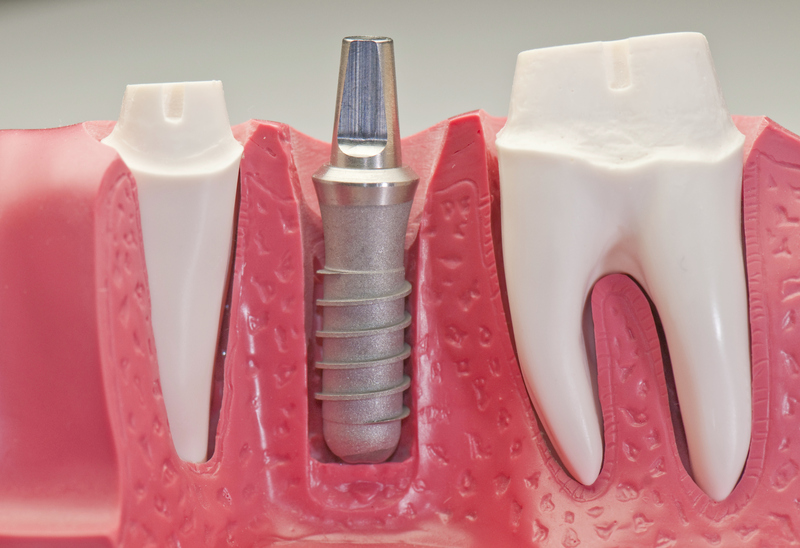 Dental implants, used to support dental prosthetics, are offered at all four Guerrino Dentistry locations. When planning for dental implants, there are many factors that must be taken into consideration. There are certain conditions that can increase the risk of implant failure. Therefore, your dentist will need to check your overall general health, including the size, shape, and position of your jaw, and the condition of mucous membranes. In addition, patients with poor oral hygiene, diabetes, and those who smoke heavily, face a higher risk of rejection. Bisphosphonate drugs and other bone building drugs have been associated with Bisphosphonate-associated osteonecrosis of the jaw (BRONJ). Even though the risks are low, there is concern that these drugs may cause bone death during oral surgery. The American Association of Oral and Maxillofacial Surgeons does not recommend implants for those who have taken a high dosage of BRONJ for more than three years. The success of implants is largely due to the forces that act as its support. Since there is no sensation of pressure in an implant, forces have to be distributed across the prosthetics. Implants placed in thicker, stronger, bone have a higher success rate than those placed in lower density bone. Your dentist must consider both biological and mechanical factors before placing the implant in order to ensure its success. Dentists can use a stent to figure out the most accurate positioning of the implant, as well as the assistance of CAD/CAM software to plan the surgery. With this technology, the surgeon can also avoid the sinus and inferior alveolar nerve, which are vital structures in the mouth. Dental implants provide many benefits, but it is crucial to choose skilled surgeons that will take the time to consider the risks beforehand. Visit one of our many Westchester County clinics to see what we can do for you! Paul J. Guerrino DDS PC is a graduate of the NYU College of Dentistry’s Arthur Ashman Department of Implantology. Paul J. Guerrino DDS PC is a graduate of the New York University (NYU) College of Dentistry and later went on to obtain specialized training in implant dentistry from the Dr. Arthur Ashman Department of Implant Dentistry at NYU. Now the certified Dentist-Implantologist practices in Westchester County at his four Guerrino Dentistry clinics. He credits his training at the NYU Department of Implant Dentistry for his success. The NYU College of Dentistry is the largest and third oldest dental school in the United States. It has educated more than eight percent of all dentists worldwide. The University created the Dr. Arthur Ashman Department of Implant Dentistry in 1991 when it took on three implant dentistry fellows. Two years later, an international version of the program began and continues to grow. To date, the department has trained 122 international dentists from 26 countries and has also had 54 fellows. It is currently the largest implant training program worldwide, bringing in a combined first- and second-year class of 37 students and about six fellows. The Dr. Arthur Ashman Department of Implant Dentistry curriculum includes two years of in-class instruction; lectures and a lab on didactic materials during the third year; as well as a clinical program during the third and fourth year. This clinical program allows students to gain experience with implant design and surgical placement. Many students are also responsible for treating at least one implant supported restoration. The Dr. Arthur Ashman Department of Implant Dentistry recently made news by naming renowned implantologist Peter M. Loomer DDS PhD the Chairman of its department. He also holds the role of Director of Global Health for oral health issues with the NYU Global Institute of Public Health. You can learn more about this announcement in the school’s press release. Paul J. Guerrino DDS PC explains how to avoid complications when having dental implant surgery (above) performed. Welcome back to my blog. My name is Paul J. Guerrino DDS PC and I own several dental practices in Westchester County, New York. As a certified Dentist-Implantologist, I have seen my fair share of patients who require dental implants. 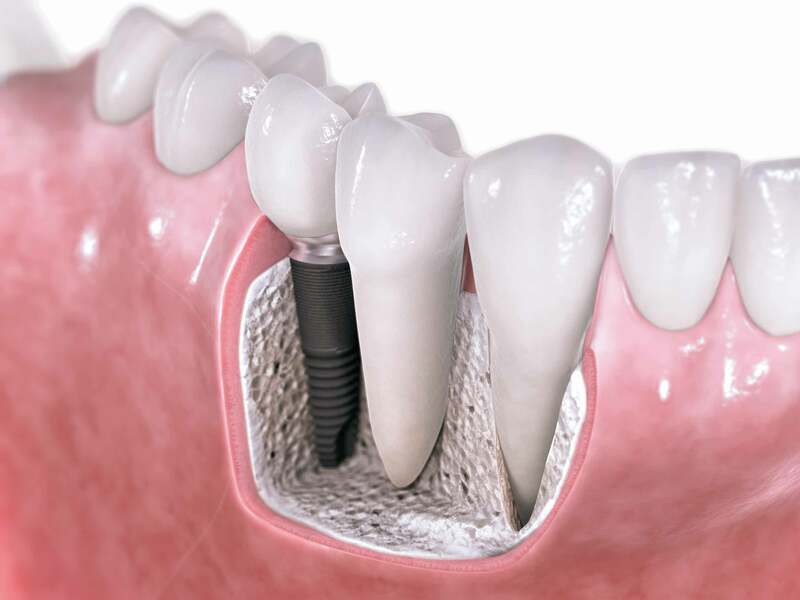 Dental implants are posts that are drilled into your jawbone to hold replacement teeth. After gums are healed from the drilling, an abutment is attached, which the false tooth can be screwed into. Implant dentistry is one of the oldest procedures in dentistry, dating back to 600 AD. The process has evolved throughout the centuries and today, the surgery is common. According to the American Association of Oral and Maxillofacial Surgeons, 70% of adults are missing a permanent tooth that requires surgery. Accidents and poor oral hygiene are the major factors contributing to this statistic. Luckily, dental implant surgery is simple in the hands of top notch surgeons such as the ones at Guerrino Dentistry. If a patient chooses to receive dental implants from a less experienced dentist, complications are more likely to occur. Typical post-operative risks of this dental surgery include infection, excessive bleeding, and necrosis of the tissue around the implant. Between 8 and 24 weeks after surgery, the patient must return to the dentist to see if the implant is properly integrated. Often, the success of this surgery is determined by the quality of the bone at the site, the patient’s oral hygiene, proper integration, and most importantly, operator skill. In the hands of a skilled surgeon, complications are unlikely. Dental implants can offer a chance at natural, beautiful looking teeth. However, it is important to choose the right surgeon to get the best results. Don’t be afraid to ask how much experience and education your potential surgeon has with implants; it could make the difference between a smooth, successful surgery, or a painful, damaged implant that will ultimately require more procedures. Contact Guerrino Dentistry & Associates to see if dental implants are right for you. Welcome back to my blog. My name is Paul J. Guerrino DDS PC. I am a certified Dentist-Implantologist with more than two decades of dental experience in Westchester County, New York. At my practice, Guerrino Dentistry & Associates, I provide patients with complete dental care and personally perform dental implant services. Sinus Lift: A sinus lift, or sinus augmentation, is sometimes required before the dental implant procedure. It is designed to prepare an area of the mouth for dental implant installation when sinuses are too close to the jaw or there is not enough bone in the upper jaw. A periodontist completes a sinus lift by adding bone between the upper jaw and maxillary sinuses. Before doing so, he or she must lift the sinus membrane to make room for the new bone graft. Dental implants are inserted 4-9 months later to give the bone graft material time to mesh with the bone. Bone Grafting: I place implants using the 1:1 crown-to-root ratio, which entails putting implants deep enough in the bone so that the crown or tooth is the only part above the bone. When a patient’s jawbone is too soft or is not thick enough, the procedure could fail. Bone grafts create a solid base for the implant by utilizing the patient’s own bone (harvested from the patient’s hip), bone from a donor, or an artificial bone-like structure. Patients will then have to wait up to nine months for the graft to grow enough bone to support a dental implant. Ridge Modification: Deformities in the upper and lower jaw can be caused by periodontal diseases, developmental defects, injury, trauma, or dentures. Such deformities leave the upper or lower jaw with inadequate space for dental implant placement. During a ridge modification, I access the defect by lifting the gum away from the ridge. I then perform a bone graft in the affected area to build up the ridge. This procedure increases the chances of completing successful dental implantation and also improves appearance. An example of a dental implant. My name is Paul J. Guerrino DDS PC, I am the owner of Guerrino Dentistry & Associates. I am also a certified Implantologist, having completed the NYU College of Dentistry’s two-year postgraduate fellowship in Implant Dentistry. A dental implant is an artificial tooth root device typically made of titanium and it is usually the best option for replacing a missing tooth. According to the American Association of Oral and Maxillofacial Surgeons (AAOMS), 69% of adults between the ages of 35 and 44 have lost at least one permanent tooth. Tooth loss can be caused by an accident, tooth decay, gum disease, or a failed root canal. AAOMS also estimates that 26% of all adults do not have any permanent tooth by age 74. A single-tooth dental implant includes three parts: a titanium implant, a crown, and an abutment. The titanium implant is placed into the gums and eventually fuses with the jawbone. Our restorative dentist creates the crown, which is a tooth-shaped structure that will provide a natural appearance. 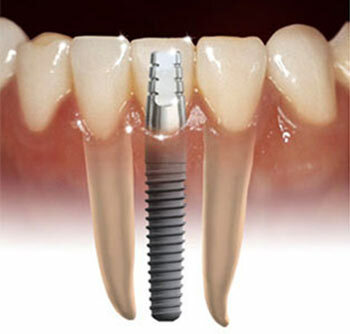 The implant and crown are connected with the abutment, a titanium or ceramic piece that covers all portions of the implant above the gum line. I begin the most basic form of the dental implant procedure by preparing the surgical site using precision drills or hand osteotomes. This step prevents burning or pressure necrosis of the bone. I then place the titanium implant and wait for the bone to grow onto the surface of the implant in a process known as osseointegration. After osseointegration occurs, I put the crown on the implant. Dental implants are also used to support a number of other dental procedures, and I will address these procedures in a future blog post.